But in practice, everyone says "It is him" and "It is me." Everyone except Don Quixote, anyway. 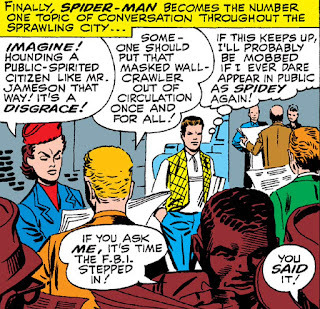 There's clearly some idea floating about that the story can't work if Peter Parker has friends, so he has to keep offending everyone somehow. Hm. I don't know much about super-heroes but do any Marvel super-heroes have non-super-hero friends who aren't the chaste love interest (like Superman has Jimmy Olsen and the Bat-man has Alfred)? Or is it a general Stan Lee Rule that super-heroes must always be Alone In The World except for other super-heroes? 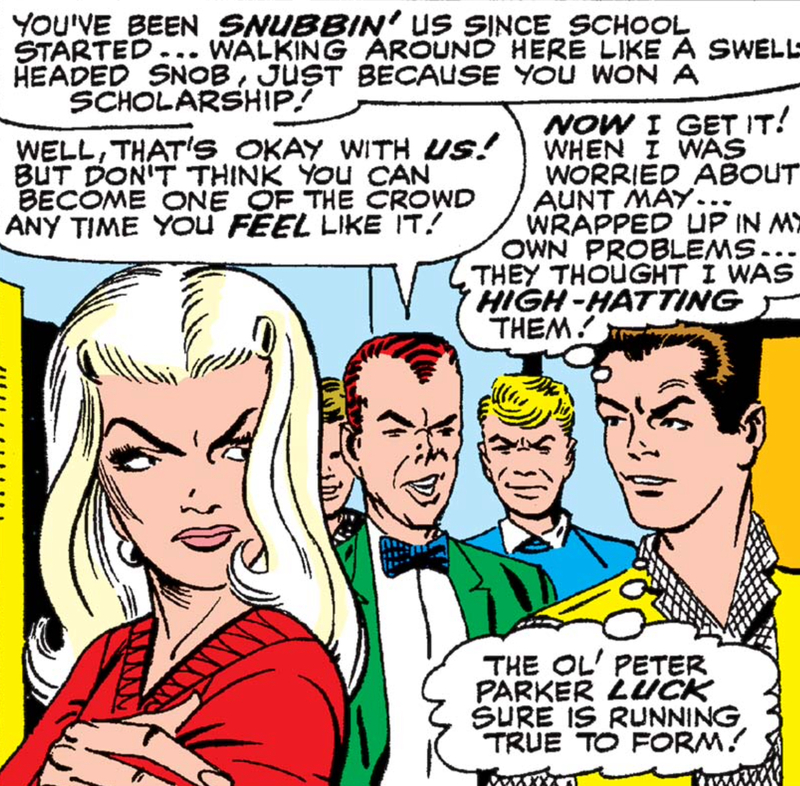 Though in general Jimmy Olsens are less common with Marvel, as the heroes themselves are less parental authority figures. Maybe that's why Rick Jones had to be shared out so much. 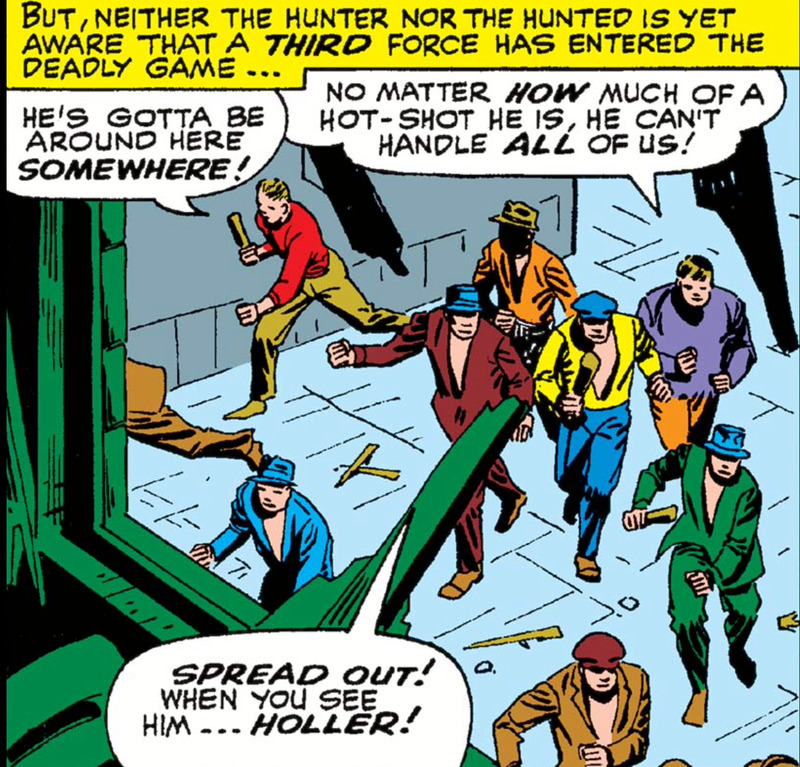 I think of Marvel heroes as being less geographically-based than DC heroes, so the problem with having too many friends is that they might notice when the character disappears for a while. 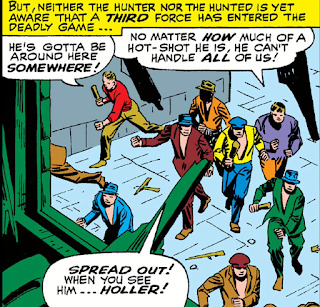 Daredevil, for example, has a number of non-super friends ("Foggy" Nelson! ), but he spends almost all of his time in NYC. I remember The mail-carrier for the Baxter building getting an entry in the Official Handbook of the Marvel Universe (though I don't remember him from the comics) and, again, the Fantastic Four both have a well-defined geographic space and are public so they don't need to maintain a secret identity. Supportive of SK's point, I do remember whatever X-Men series in was that paired an old issue of X-men with a new vignette those stories often featured a member of the X-men hanging out with a normal person for a while and then having to abandon the growing friendship because of the demands of being a super-hero. 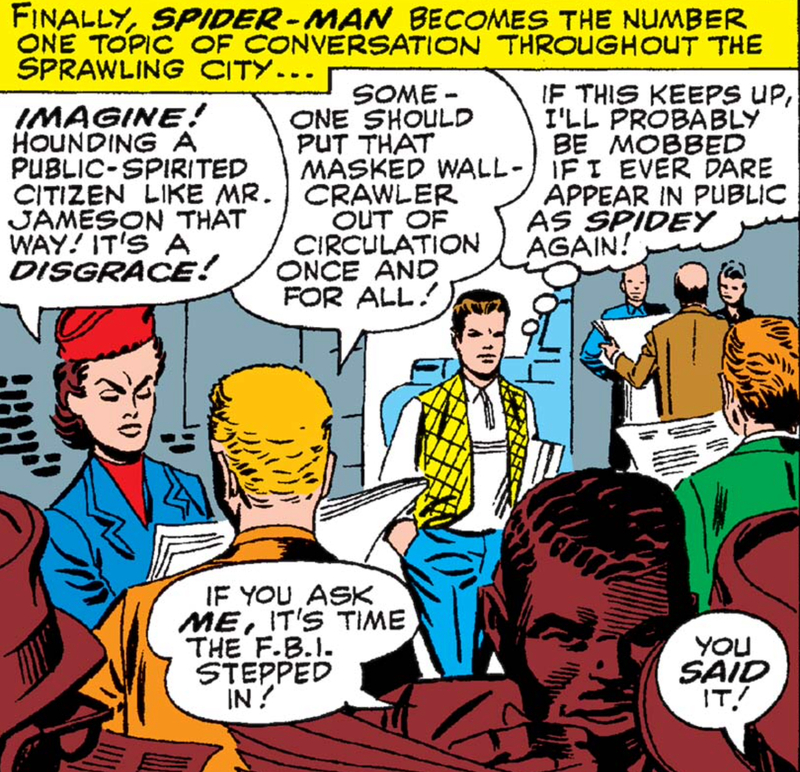 I wonder if it was at first a Ditko thing? The true objectivist man stands alone and needs no-one else? 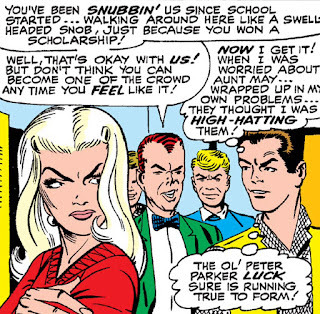 The very first thing which happens when Ditko quits is that Peter Parker and Harry Osborn have a heart-to-heart, and within a few issues Peter is having a highly successful blind date with Mrs Watson's niece and making friends with Gwen. And buying a motorbike? 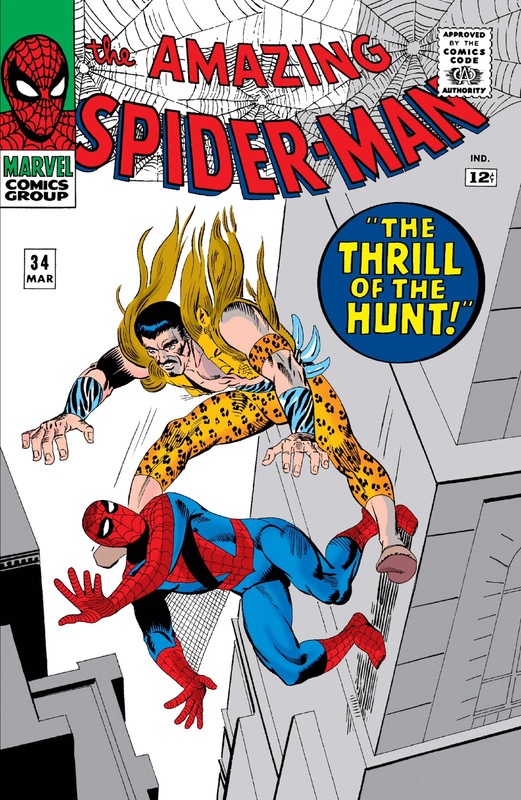 One of the worst abominations Marvel ever perpetrated, says Ditko's biographer. But Lee goes more and more towards the angsty outsider as time passes, mainly because he can write angsty soliloquies by the yard. The Silver Surfer had virtually no attributes apart from angsty outsiderness. Captain America went through an oh woe is me for I am a man out of my time stage.